"Monkey Brains is a new collection of hair care that allows you to express yourself. To be fun, be cool and be yourself! Look around. How many styles do you spot everyday: spikes, fauxhawks, and controlled messiness... Everyone you see is sporting an individual look! With 2 Gels, 2 Glues, a Pomade, a Hair Refresher and a Shampoo and Conditioner you will be able to rock whatever hairstyle you're feelin' at that moment.One day you don't feel like getting in the shower and the next you're searching for the hair gel. But you're confident about how you want to look on any given day. Monkey Brains gives you the tools to look cool and have fun doing it." 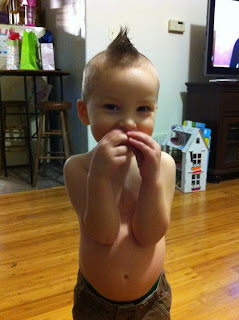 What we thought: These hair products were fun for the kiddos to use. They smelled great, were easy to apply, worked well for styling and washed out easily. 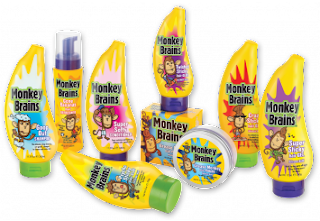 They would be perfect for the tween in your life:) Monkey Brains has quite a variety of products ranging from gels with various hold strengths, shampoo and conditioners, pomade and hair refresher...everything a kid could possibly need to achieve that much sought after perfect hair statement:) ABCD Diaries gives Monkey Brains an A+! Buy It: Find these fun hair products for your kiddos at WalMart and Walgreens!